Feel free to browse our Membership Directory below. Contact Information is available for members listed. We are a small farm dedicated to loving and breeding quality straight egyptian arabians. We concentrate on carefully matching phenotypes, bloodlines and strains of our mares with the stallions we choose. We chose our mares based on structure, athletic ability, beauty and live in your tent personality. 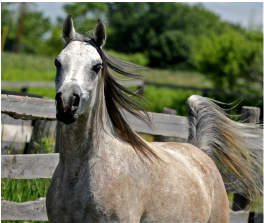 We believe that an Arabian should be more than just a beautiful horse. It was bred to be a hardy breed capable of almost any task put to it. Berryland Farms is a family-owned and operated hobby farm. Purchased in 2003 by Rick and Nancy Merkel as a home for a lone Arab gelding named Casper, the farm has grown and flourished into the family-friendly endeavor it is today. Come visit us and enjoy Berryland Farm as much as we do. Starting in 1969 we have seen the best, but narrowed our bloodline choices to those we know do reproduce the qualities we wish to retain. We are standing the Imperial Madheen and Safeen grandson Champion Madheen El Masr by live cover and he has produced several Champions. A recent visit by highly notable breeders/judges gave the remark that our Madheen was one of the top 5 stallions in the Country. I felt highly complimented. We are proud to say there are many well known breeders in Europe and the Middle East have our breeding in their herd. one of our mares for your breeding path to success. Jericho Creek Farm II has been raising Arabians, Morgans and Morabs of distinction for over twenty-five years. 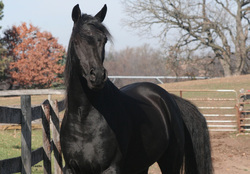 Nakhda Karim our Straight Egyptian stallion has an excellent pedigree and sweet, people-loving disposition. Please visit our website to find out more about our beautiful horses. Our Desperado daughter MB Minuet has produced 3 foals all with different sires and all 3 have placed Top 5 or better at 2002, 2005, 2009, and 2011 Egyptian Events. Now Minuet's daughter; MH Roxy Hart has produced a filly out of Radar Love, who will be making her debut at the 2012 Egyptian Event. MH Roxy Hart placed 1st AOTH and placed 3rd in Two Year Old Futurity. Show quality Arabians, offering individuals for sale and stallion services. Varied pedigrees to suit the needs of Arabian owners, Halter to English, we strive to provide what suits your needs. Our breeding program produces excellent minds, that make great horses. We are standing 3 Straight Egyptians; Arabest Samir, The Elixir and El Shuja Wahid. 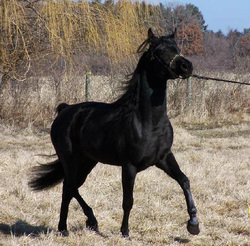 Wojchik Arabians is a small breeder of black, Straight Egyptian Arabians in the West, Central portion of Wisconsin. We offer young, black Straight Egyptians and Al Khamsa Arabians for sale.